Before we begin our journey into the best dog harness for Basset Hounds – it is important to consider the breed. Basset Hounds are scent hounds originally bred for the purpose of hunting hare. Like the bloodhound, they are driven by their sense of smell, which makes walking them an olfactory adventure. This can make walking a Basset Hound problematic. Firstly their sniffing leads them in every direction bar the straight line you were hoping for. Secondly, the tendency to suddenly pull is a strong one – and one that can result in both discomfort for the dog but also the walker holding the leash. A Dog Collar or a Harness for a Basset Hound? Ideally both. 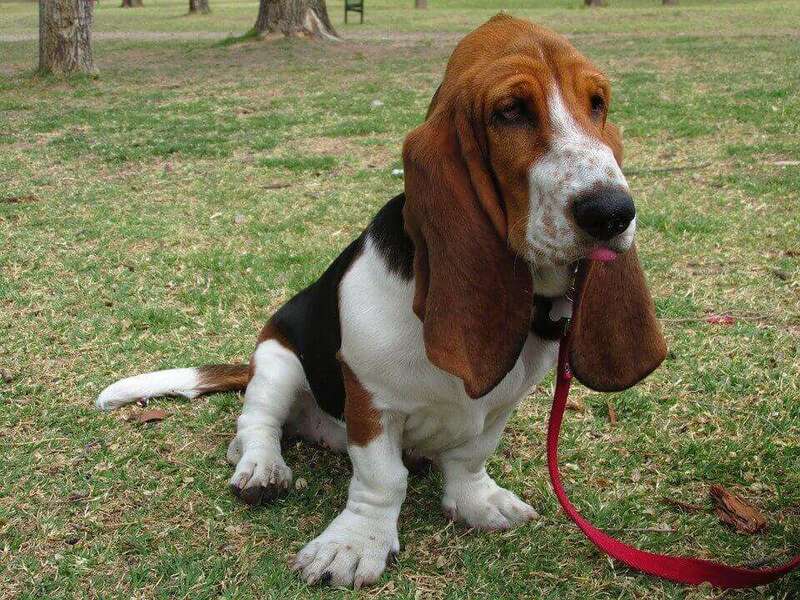 If you have a Basset Hound who pulls on the lead – walking them on a collar is usually bad news. To begin, any dog which pulls on a lead can suffer from throat injury when there’s a sudden lunge. The lunges can also cause pain and discomfort to the dog which can result in increasing the pulling behaviour. Although a collar is fine for both ID tags and walking a well behaved (often adult) Basset Hound off their lead, they’re not particularly useful for controlling your dog, reducing their pulling behaviour or for training. With their tendency to pull, a well designed no-pull harness is often best for Basset Hounds. Although many off-the-shelf harnesses claim to reduce pulling – many achieve different results. Some harnesses, for example, are front-range which means they allow for double-ended leads to be attached for better control. Others have handles and are designed to be ultra secure. More on these points will be discussed below. However, some harnesses also have flaws which are not immediately obvious. Some harnesses which are poorly designed puts additional pressure on the dog when they pull. This is often a harness with a single lead attachment point where the harness tightens when your dog pulls. This not only results in pinching and pain for the dog but can also cause an increased in the pulling behaviour as the dog attempts to escape the discomfort. 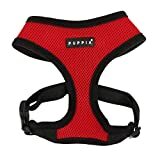 Ruffwear makes exceptionally good harnesses and as a result, are an incredibly well-known brand. 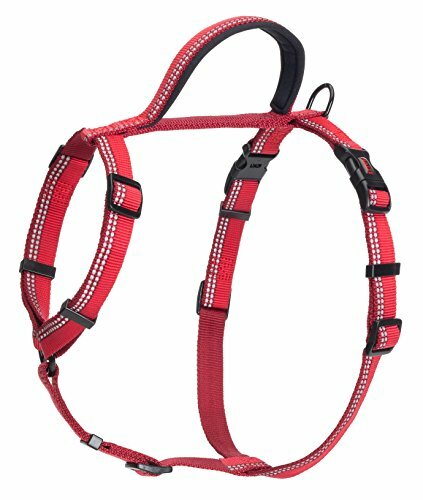 The All Day Adventure harness is not only a superb harness to reduce pulling but also looks stylish, fits well and is great for training. The All Day Adventure is a front range harness. This places two separate lead attachments on the harness. The front is located at the front, or chest, of the harness and the second is located at the top, back. The harnesses back lead attachment is for standard walking – simply attach the lead as you would on any harness or collar and go walking as normal. This is the most robust attachment on the harness, made from a strong aluminium V-ring. The second, front, attachment loop is made from a reinforced webbing. Though a standard dog leash can be used for the back – a special double-ended training lead such as HALTI is required. These leads have two separate clips and can either be used as adjustable length leads or attached to both parts of the Ruffwear harness. This then acts similar to the way reigns work on a horse – guiding the direction of the Basset Hound. In addition to offering increased control, it also teaches your dog to better behave on the lead – especially if pulling is an issue. The construction of this harness is excellent. The harnesses inner lining has chest padding as well as belly panels. This is not only for the dog’s comfort but also to insulate your dog from sudden jerks caused by pulling behaviour. A lightweight, sturdy nylon material covers harnesses the outer layer. The woven straps can be adjusted at the shoulder, chest and belly for not only a more secure, but more comfortable fit. Reflective strips line the outer layer of the harness for increased visibility at night. popular brand, especially for larger breeds. For this collection, we’ve chosen the harness with the additional security strap. Because of a Basset Hounds habit of weaving from side to side as they sniff, they can be sneaky and inventive when attempting to escape their harnesses. The Julius-K9 harness has a highly secure stainless steel INOX ring at the top (back) for lead attachment when out walking. The handle at the top is incredibly strong and can be used for holding your Basset Hound in position, for training and for extinguishing pulling behaviour. A heavy duty strap and buckle are used for putting on and taking off the harness. Julius-K9 are also known for their distinctive replaceable side labels. Many people either just leave these as is, or remove them – but those wishing for more customisation – there are dozens of designs to choose from. The inner lining of the harness is an OEKO-TEX breathable and skin friendly material. The harness has a reflective chest strap for greater visibility when out in dark conditions as well as edge protection. 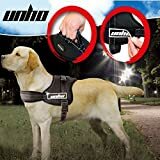 Other features of this dog harness include the water repellant cover, a flashlight holder and an optional side bag attachment. 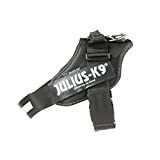 Julius-K9 recommend size 1 (25-33.5 inch chest) harness for a Basset Hound, although it is still worth measuring as size/weight could vary. Overall the Julius-K9 is not only reliable but very strong. 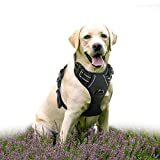 It does not, however, have a front clip so couldn’t be used like the Ruffwear – but depending on your dog’s behaviour – this could be ideal if front range harnesses have proven unsuccessful. 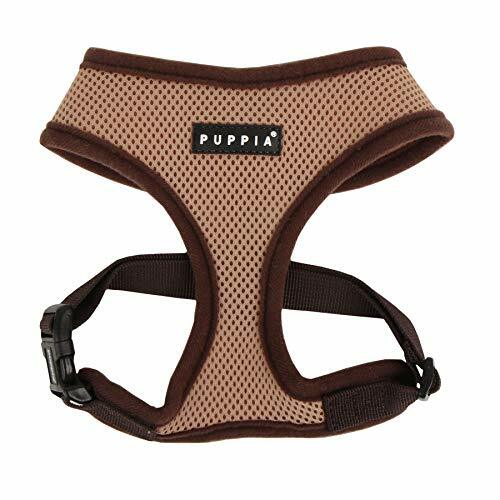 Another hugely popular harness that features often in our dog harness collections. 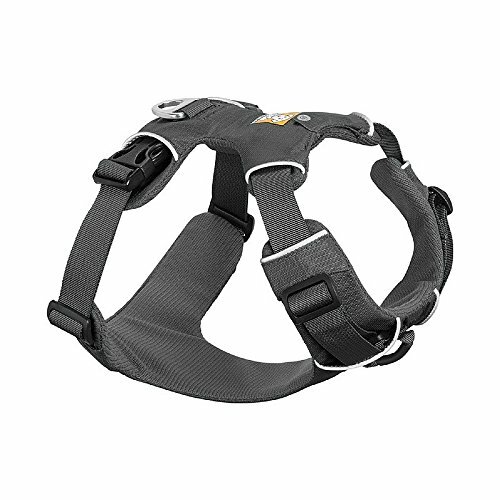 The Rabbitgoo is another excellent example of a front range harness where there are lead attachments on the front (chest) and top (back). Like the Ruffwear, these can be used in combination with a double-ended leash like a HALTI training lead. The Rabbitgoo has two adjustable straps on the side. The first strap is located around the neck and the second on the harness front. It is noted, by us and external reviewers, that these straps can be a little rigid. While a small problem, it can be a little irritating when trying to improve the fit. The harness is put on and removed using a quick release buckle. Finally, the harness uses high visibility reflective on the outside for better nighttime visibility. Despite a few rigidity problems – this is still a good harness which many owners of multiple breeds swear by. It’s also fairly inexpensive – so if you’re looking for a mid-budget but dependable dog harness – you may want to consider the Rabbitgoo. We love the HALTI training lead – but we aren’t huge fans of their harnesses. Saying that many dog owners swear by them so it comes down to preference. This is probably down mainly to its somewhat unique style which is different from all the other in this collection. Although distinct, this is also a chest harness like the others in our collection. Its coverage around the dog’s body is significantly reduced and therefore has less padding than most dog harnesses. This isn’t necessarily a bad thing, just a functional configuration. This is particularly useful for dogs who are not suited to wearing a head harness. The lead is attached to a clip at the front of the harness – there is also a safety clip for collar attachment. The main part is made of durable nylon webbing which is not only strong but won’t pull into the dog’s skin. The HALTI has five points of adjustment for a better fit and comfort. One particularly nice feature is the addition of a close control handle for instant restraint, improved handling and training. There is also a 3m reflective trim on the HALTI for better visibility at night or in darkened conditions. Obviously, this type of harness is a vast improvement from a traditional collar – particularly if you have a puller. Instead, the dog’s chest and shoulders are where most of the control is placed. Although this harness may not be for everyone – it is still a solid harness. It’s popular and generally, reviews of the harness are positive. isn’t great for behavioural problems in pulling dogs – but as a comfortable, lightweight and affordable alternative to a collar – it could be perfect for your Basset. The Puppia comes in a range of sixteen different colours including red, green, black and blue. The harness is made of a soft air-mesh material and is particularly comfortable around the neck. The lead attaches to a stainless steel hoop on the middle of the top. The harness goes over the dogs neck and clicks into place with a buckle. The straps can then be adjusted for a better fit. One comment on this harness we’ve sometimes heard is that the fitting can sometimes be too loose/tight – so double check your Bassets measurements before purchasing. 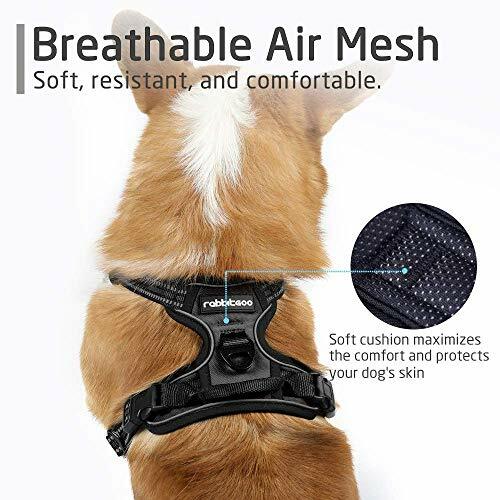 This is certainly a harness designed for comfort – so if your Bassett is having mobility or neck problems and is generally well behaved on the lead – this could be one to consider. We end our best Basset Hound harness collection with one of the most affordable harnesses available. The UNHO harness is not dissimilar in design from the Julius-K9 and although possibly not as well constructed or feature rich is still fairly good. 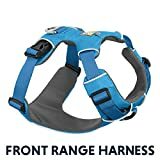 This harness may be an ideal choice for those on a budget or looking to introduce a harness to their Basset Hound when they’re unsure how they will take to the idea. The outer layer of the UNHO dog harness is made from thick nylon, nickel-plated hardware, material. The underside inner layer is made from soft, breathable padding. We hope you have enjoyed our best dog harness for Basset Hounds collection. As one of the kings of smell, this breed can be mischievous pullers – so a no-pull harness is a great way of extinguishing the behaviour. Our preference is for the Ruffwear Adventure harness as, in addition to being strong and adjustable, it is also a front range harness. 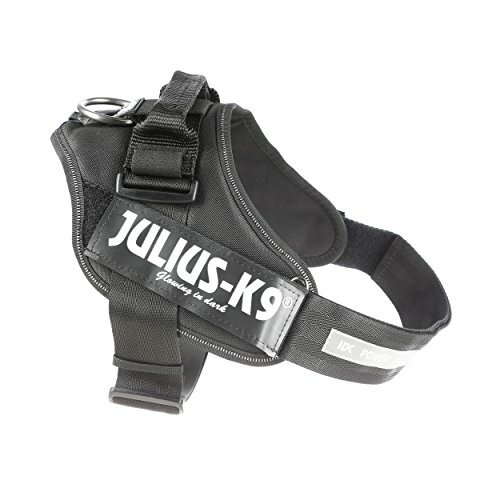 However, if a double-ended lead or this type of harness isn’t for your Basset Hound – the equally popular Julius-K9 is also a strong contender. Before ordering a harness for your Basset Hound, always check the measurements. Most manufacturers include measurement guidelines with their harnesses. As a brief guide; use a tape measure and measure the width of the widest part of the chest as well as the neck. You may also need to measure the dog’s weight as it can be a strong indicator of pulling ability. For more information check out our guide to measuring and fitting a harness. If you have any experience of the harnesses in our collection or alternative suggestions – don’t forget to let us know in the comments section below or by posting on our Facebook page. 2018 - 2019 The Geek Dog Network UK. All rights reserved.